The United Nations of Comedy Tour returns to The Paramount Theater on Saturday, November 12. This tour features national comedians as seen on NBC’s Last Comic Standing, Showtime, HBO, Ellen, Comedy Central, Comic View, TV shows, commercials, movies and other national programs. The United Nations of Comedy has become one of the area’s most highly anticipated comedy shows to visit the Paramount. From audience members bumping their head on the seat in front of them to tears streaming down their face, these things happen from uncontrollable laughter. The Tour was founded with the premise of promoting diversity through laughter. The tour’s creator places focus on choosing the perfect blend of national comics by selecting an eclectic mix of comic styles. This year’s line up includes an hysterical array of national comedians: Emma Willmann, Funnyman Skiba, Antoine Scott, Alex Carabaño and Jason Andors. It does not get much funnier than that. Buckle your seatbelt and prepare for the ride of a lifetime but you may want to use the restroom first. Back by popular demand, this will be Funnyman Skiba’s 11th visit to Charlottesville and his sixth visit to the Paramount Theater. He has been named the funniest comic alive and is extremely difficult for comedians to follow. Emma has made the list of being one of the Top 10 comics in New York. She has her own show on Sirius Radio and has appeared on a variety of national television programs. Being the only lesbian comic on the line up, she fits in perfectly to shake it up. She’s been featured on AfterEllen, Comedy Central and others. Jason Andors is legendary for his real life comedy making fun of himself as a young jewish guy who used to break dance and later, appeared on Showtime at the Apollo, BET Comic View four times, showing how real comedic talent can make anyone laugh. He also appeared on HBO, Showtime, Comedy Central and many other outlets. Representing the latino community, Alex Cabaño has been labeled as one of NY funniest comedians and appeared on CBS, Telemundo, BRIC Tv, etc. Antoine Scott has the ability to win over any crowd. He has appeared on TVOne and Showtime at the Apollo. Doors to the Theater open at 6:45pm for VIP ticket holders and 7pm for general. General Admission tickets are $38.25; VIP tickets are $48.25, which include a Meet and Greet Reception with catered food, drinks & a live performance by the Robert Jospé Express, premium seating in the center orchestra section. Tickets may be purchased at The Paramount Theater, located on the Downtown Mall at 215 East Main Street, Charlottesville, VA, online at www.UnitedNationsofComedy.com, www.TheParamount.net or may be purchased by phone at 434.979.1333. For event sponsorship opportunities call 434.825.0650. 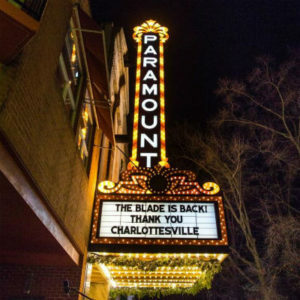 The Paramount Theater was chosen as the host venue for its elegant appeal, historical wealth and its extremely convenient location on the the downtown pedestrian mall. This event is sponsored by Cville Weekly, Melody Robbins Photography, The Hyatt Place, Yellow Cab, and the Charlottesville Albemarle Convention and Visitors Bureau.